The World Cup is coming to an end and we’re all making plans to watch the final. Whether your team will be fighting for victory or not, this is a moment that just can’t be missed. Obviously, it’s the perfect opportunity to catch up with friends and on top of that, it’s a reason to enjoy good food. 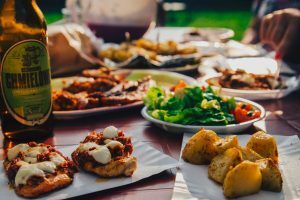 If you and your friends have decided to avoid the frenzy of bars and pubs for the comfort of someone’s home, how about spicing things up by bringing some delicacies from the countries you are (or were) supporting? If you were rooting for Belgium and wanted to see the Red Devils lift the trophy this Sunday, you might have to go for a classic dish. French fries are loved by all and you could even go the extra mile by adding some mussels for the perfect combination. 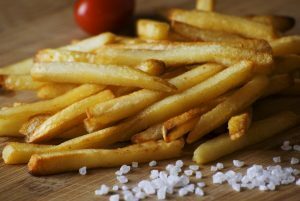 As simple as it seems, cooking French fries is actually a bit more complex than you might think. To make sure you get that golden colour and crispy texture, the potatoes need to be fried twice. The first time at a low temperature to make the inside tender, and a second time at high temperature to get the perfect, golden, crispy fry. 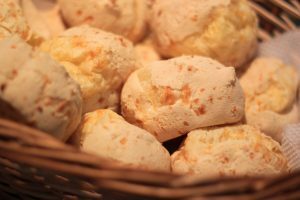 For those behind the Brazilian team, entertain taste buds with some Pão De Queijo (Cheese Bread), some Pastel de Queijo (Fried Pastry with Cheese), or some Coxinhas (Chicken Croquettes). These little treats are a great way to whet your appetite before the main dish. Pao de Queijo can either be soft or crusty dependent on your liking, while the Pastel de Queijo is a crusty pastry filled with cheese. However, as well as cheese, some tend to add other ingredients like meat, tomato, chicken, or even fish. The Coxinhas are a mixture of chicken and seasoning covered in dough and mashed potatoes. The dough itself is coated in breadcrumbs to give it a crispy golden finish. If you’ve been watching every Croatia game since the first round and want to see them get their revenge on France for the ’98 semi final, why not make a Crni Rižot. 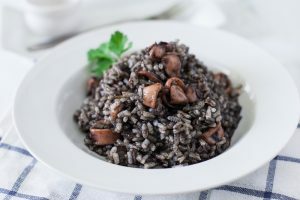 Found in virtually every restaurant along the Dalmation cost, Crni Rižot is a black risotto perfect for seafood lovers. Pretty much any seafood you could think of can be added to this dish, whether it be calamari, squid, cuttlefish, clams, or mussels. To get that black colour the trick is to use squid ink, and it’s up to you how much you want to add. The more you use, the stronger the colour will be. If you too were expecting Football to book its ticket on the 11th to find its way home on the 15th, you might already have an idea of what you could eat for your World Cup viewing. 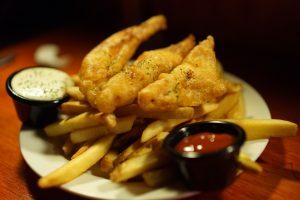 The iconic British duo, Fish and Chips. As basic a dish as it is, it’s still a great choice for seeing friends if you don’t want anything overly fancy. However, you could be original with the dips that you offer; from Horseradish and Caper Sauce with bacon, Malt Vinegar and Dill Mayo, to traditional Tartare Sauce, keep things interesting with an array of different flavours. 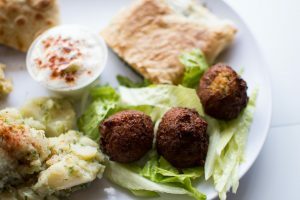 When it comes to the ones who were backing the Egyptian team, it might be best to go for a dish that seems to be enjoyed by all, Falafel. Although its origin causes a lot of controversy, not being totally sure where it comes from, many believe that it was invented in Egypt by Coptic Christians. These fried vegetable balls are a great way to enjoy more than one flavour at a time whether you decide to use chickpeas, beans, pickles, tomatoes, or onions. On top of that, dips like hummus or hot sauce are the perfect addition for you to savour them. If you are part of those who want “Les Bleus” to emerge victorious from their Sunday game against Croatia, you are automatically designated as the bringer of desserts. 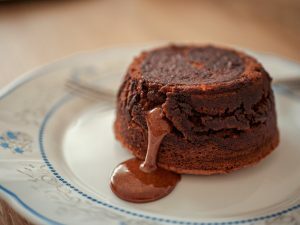 And why not take the opportunity to offer a delicious Soufflés au Chocolat. Whether you like it neat and compact, or with chocolate dripping down the sides, everyone will appreciate this as a great way to end the meal. 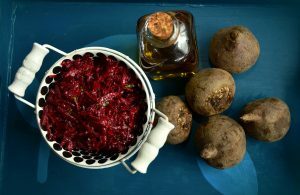 Finally, if you were rooting for the host team, your best bet is probably providing starters, so why not go for some Beetroot Salad to start the meal off right. To give the salad a creamy taste, some would add mayonnaise. You can also add a variety of veg like carrots, onions, or potatoes to put your own twist on it. So wherever you will be when France or Croatia lift the trophy, make sure you’re surrounded by good company, plentiful drinks and great food.